Ahead of the release of his devotional and biographical film Om Namo Venkatesaya, Nagarjuna is cool and composed. No, he’s not a bundle of nerves and is quite confident. In my entire career, I was never tension free and was never fearless. But today, for the first time, I’ve neither tension nor fear before the release of my film. I’m very much confident. Om Namo Venkatesaya is my career’s best film till date. It’s a complete film, said Nagarjuna Akkineni. 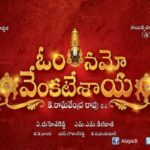 Veering towards Producer A. Mahesh Reddy who expressed shock for accepting Om Namo Venkatesaya even after three back to back commercial hits (Manam, Soggade Chinni Nayana and Oopiri,) Nag said, If not now, when will I do such devotional film. Commercial films can be done at any time. But very rarely actors like I get such opportunities to do devotional subjects. Now ahead of the release of his devotional film Om Namo Venkatesaya, Nag is at it again. Om Namo Venkatesaya is my career’s best film so far, announced Nagarjuna adding that it’s a complete film. He said, For the first time in my entire career, I’ve no tension or fear before a film’s release. I’m pretty free. Even many of my close friends in industry have asked me to show the film once, I told them, why hurry and watch it after release. I want to thank all of you (media) now. Because, there’s no need to thank you after the film’s release. Nag hinted that the movie would do the talking after its release. Directed by K. Raghavendra Rao, the film chronicles the life and times of Lord Balaji’s devotee, Hathiram Bhabaji. The film features Anushka Shetty, Pragya Jaiswal, Vimala Raman and Sourabhraj Jain besides Jagapathi Babu, Rao Ramesh. The film is all set for a release on February 10.